* This is a summary of the some of the main questions and answers picked up from a number of questions relating to the Business Report and Agendas. I would like to ask about your policy regarding the acquisitions and other investments you deem necessary to reach your targets by fiscal 2022. In light of impairment losses from past acquisitions, how have you changed your criteria on determining investments. We plan to invest around ¥100 billion each in acquisitions under growth strategies #1 and #2. We will determine the investments we select in keeping with our strengths. We reviewed our acquisitions in North America and confirmed that there were no strategic issues with the purchases themselves. That said, we recognize that post-merger integration processes are important. We therefore look to undertake improvements in terms of impairment loss accounting and other respects. What measures are you taking to harness and better motivate Ricoh Group employees? Ricoh has strengthened its workstyle innovation for clients from the perspective of work practice reforms, and we are undertaking improvements ourselves. I recognize that such reforms must lead to improved job satisfaction. In relocating headquarters, we decided to run satellite offices and offer more telecommuting opportunities to employees. I also acknowledge the importance of revising our personnel assessment systems. Since January, I no longer have my office, and I moved my desk to be in the same areas as employees. I distribute a videogram message once or twice a month. Another change has been to use a new setup so employees can watch policy announcements on their PCs. I take questions from employees when I go to the frontlines. When the frontlines are energized, employees are too. It bothered me that just one woman was on stage at the general meeting of shareholders. Ms. Hatano, what is your stance on female inclusion in the workplace, and where is the company heading in regard? Females have a vital role in the workplace. We have adopted a range of programs, and have received recognition in the premier stage of the Japan's Ministry of Health, Labour and Welfare Eruboshi certification system for providing equal opportunities to women. Women also serve executive officer and directorship roles at Ricoh. For example, the Deputy General Manager of our Human Resources Division is an American woman. The COO of Ricoh Europe is female. Women account for 15% of the number of regular employees on our domestic payroll. They represent around 4% of our managers. We aim to lift that percentage to 10%. I honestly think that Ricoh is highly committed to providing employment opportunities for women in Japan and overseas. Ricoh's female researchers are active among academic societies and other organizations. And we are cultivating females as candidates for directorships down the track. Ricoh maintains an outstanding R&D program, and has secured countless patents. How is it leveraging these capabilities in its business? We undertake research and development in keeping with our growth strategies. With printing technologies under Growth Strategy #1, we are broadening our capabilities in industrial printing. Our R&D efforts look further into the future through applied printing and other initiatives. Our R&D efforts extend to the medical, pharma, and other arenas. These markets offer tremendous growth potential. Under Growth Strategies #2, we seek to broaden the scope of digital services from offices to also encompass frontlines sites and society itself. We are accordingly working on applied technologies for the Internet of Things and artificial intelligence. I'd like to add that we're taking approaches that differ completely from those for core businesses to explore new ways to launch new businesses. We have created a dual system setup in-house in which we leverage different approaches to pursue open innovation and undertake venture initiatives. I assume that demand will expand for the security cameras that will serve in all aspects of the social landscape. What efforts is Ricoh undertaking in this regard? 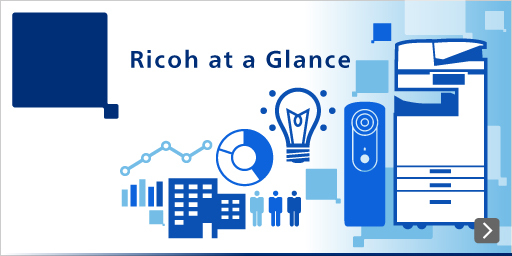 Ricoh's strengths encompass such areas as optics, image recognition, and sensors. We are working in an array of fields, from real estate, construction, and other industries to vehicular and production site automation and in social infrastructure. Are you planning to rehire Ricoh Group employees after they retire? Could employees after they retire? Could I would like to provide more information on retirees. We retain more than 90% of our people in senior roles after they reach the retirement age of 60, and they continue to serve until they are 65. We will look into providing information on retirees. In May, you announced the transfer of some of your shares in Ricoh Logistics to SBS Holdings, and employees worry that there will be a restructuring. Why did you make this transfer? Logistics is vital to supplying products to Ricoh's customers. The logistics sector needs to invest significantly to overcome personnel shortages and automate. We cannot prioritize such investments within the Ricoh Group. SBS Holdings is growing very fast and investing extensively. It looks to integrate its operations with the nationwide network of Ricoh Logistics to generate synergies, and can expand its logistics operations. I think that all this will generate more opportunities for Ricoh Logistics employees. An article in a weekly magazine this week ranked corporate heads. Mr. Yamashita scored 80 points in disclosure aspect and placed 172nd in total ranking. What's your take on this? I recognize last year's financial results affected my ranking. I think I performed well in terms of my approaches to disclosure and transparency. I will endeavor to improve my score. On the matter of retained earnings, what elements do you prioritize in determining dividends? At this stage, shouldn't you make growth investments more important than stable dividends? And wouldn't it be better to hold your general shareholder meetings at headquarters? That's a valuable opinion on the meeting venue. We will keep that in mind. We consider cash flows and investments in determining dividends, and aim to return retained earnings to shareholders. I think that prioritizing growth over stable dividends is a valuable suggestion.